Well I bet chummy-boy here never gets rumbled in his spying escapades. I mean, who would ever guess that Guy Spy is a, gasp, spy? "So Guy Spy, what do you do for a living?" "I'm in charge of fresh meats at the local Kwik Save." "No you're not. You're a ruddy spy!" "Blimey, it's a fair cop. How did you find out?" Who knows, eh? It's just like the fact that James Bond is supposed to be this dead secret agent, but every time he goes into a bar it's "Ah, Good Evening Mr Bond you secret agent, you" Crap, the lot of 'em. And on top of all that, Guy Spy (for it is he) doesn't seem to think that running around the world waving his gun about is in any way conspicuous. And what is he doing when we first see him? Legging it into a Berlin tube station and shooting loads of baddies. That's what. Very undercover. I don't think. And, lo, here we must grab our stick and guide Guy on his quest for the Crystals of Armageddon (dan dan daaaaan). Well, by now that little seed of doubt nesting twixt your brain-stem and nasal passages has probably bloomed into fully-fledged apprehension. So yes, it is by the people who inflicted Space Ace and Dragon's Lair on us. And yes, the screenshots do tend to say 'looks nice, plays like a toilet'. But, oh gentle and fair reader, let me cool your steaming brow, for Guy Spy isn't nearly as cack as those 'epics'. On the other hand, it is still fairly ropey as an actual game. You see, no longer do you have to just twitch the joystick in one direction at the right time to progress. Now you actually control Guy on the screen, and can move whenever you want. Unfortunately, we've still got the "oh wow, it looks like a cartoon" graphics so even the most exciting shoot-outs play in slow motion. It does, being nice for a minute, successfully convey the feeling of a story by having loads of different levels in different styles. There are a couple of Oppo Wolf-style sections (most notably the first two levels in the tube station and the cable car), and there's a skiing bit, viewed from behind, and a maze bit and loads of others. But the problems lies with the graphics. They're so big and colourful that they don't move quickly enough, and the controls feel really sticky. I've lost count of the number of times I died on level one just because Guy wouldn't respond to my commands fast enough. The other loss from the earlier ReadySoft games is the speech. With more control over the on-screen actions it just doesn't look like there was room for the wazzy audio effects. Chugging guns are about the limit here. Hmmm. To sum up then, Guy Spy is a big improvement over the other ReadySoft 'efforts', and a damn sight cheaper too. But on the other hand, it's still a long way from being a playable game. Maybe it's time to admit that cartoon-quality graphics and animation on the Amiga just don't make for good games. Get the gameplay right, then bolt on the flashy bits, not the other way round. It's getting there, but still no cigar I'm afraid. To use a phrase still all too commonly used for ReadySoft games, it looks great but not really worth forking out the wonga for. It's been nice knowing you Mr Bond. Ha ha ha ha ha ha ha ha ha. They look good in screenshots, but are very sluggish to control. Not terribly hot, you'll be sorry to hear. Too slow and syrupy to be instantly appealing. Different level styles add interest, but no fun really. Dragon's Lair and Space Ace both had stunning graphics, but lacked the gameplay that ReadySoft's awe-inspiring animation promised. Can their latest graphical extravaganza break the jinx? Dragon's Lair, but with gameplay. Of course it seems such an obvious concept after those clever Canadians have gone out and put a game behind the stunning graphics and come up with Guy Spy. Guy's a cunning lad. No-one would ever think he was a secret agent with a name like that. He's been given the job of saving the world from Von Max, a failed Nazi, who has in his possession a clutch of mysterious crystals. But don't worry because Guy's armed with very sharp reflexes and also a really quite astonishing pair of boots. Guy Spy is a character that really is under your control. He walks! He skis! He attacks the walking dead with scimitars! And what's more, his size-15 boots flap around comically at the same time. 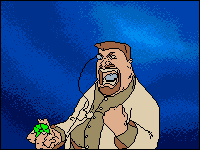 The game is divided into 13 stages, tracing Guy's journey around the world as he pursues the portly Von Max. The presentation is, as you'd expect, excellent. The graphics and animation are great, and although the pipey music quickly becomes irritating, there are some top- notch sampled effects. As for the game itself - well, sadly it seems that Guy Spy is destined to be remembered with slight affection as a Brave Attempt. Rather than make sweeping statements about the game as a whole, I'll take you through the various stages and point out once again why a game like this has failed to come up with the goods. Stage one finds Guy pinned down at a train station by a squad of Von Max's goons. 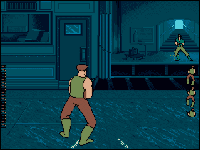 The joystick controls Guy's gunsight as it wobbles around the screen, with diagonal movement causing the super agent to leg it to avoid the opposition's bullets. But oh no! By keeping the gunsight in the corners of the screen, you can blast every goon as he runs on to the platform. Scene two is, erm, actually rather good. Guy rides a cable car across the mountains while Von Max's men fire at him from the car ahead. It's very fast and great fun as you dodge from window to window, occasionally stopping to reload before beavering over to the opposite side of the car and then blazing away because one of the villains is about to toss a stick of dynamite at you. Not too much of a challenge but highly enjoyable. Scene Three takes place in a Swiss mountain cabin, where Von Max releases the unsurprisingly huge Olga to finish off our hero. Guy has to dodge Olga's blows and try to wrongfoot her so he can slip past. But oh no! By running up to the cabin door while Olga is making her entrance, Guy can escape straight away. Scene Four finds Guy skiing down the mountain. Various obstacles loom up out of the mists, and Guy has to swerve to avoid them. But oh no! The obstacles appear at random, so Guy has to hope luck is riding with him. After this scene, the action switches to Egypt, where Guy is cunningly trapped inside a giant pyramid. Scene Five finds him wandering the corridors, ever alert for fiendish traps. But oh no! By merely keeping Guy on the move at all times, you avoid every single one of the blessed things. Halfway through the game, and scene six finds Guy battling the sinister god Ramah-Kul. Everyone's favourite secret agent has to pick up swords and throw them at the god while avoiding the blasts of energy that he calls down from above. But oh no! The blasts are directed at Guy's last position in the room, so all you have to do is, again, keep him moving. Seven, eight and nine are more fight scenes. But oh no! By keeping the fire button pressed you defeat your opponents with ease. Scene nine is another fight, this time no a log high above a raging river, with - yes! - more easy pappy opponents. To beat the level you have to cross the log. Cunningly, the instructions omit this slightly important piece of information. So, after about an hour's play we're on scene eleven. To make up for the embarrassing simplicity of the previous levels, this one's stupendously difficult. Guy bas to run through a forest, jumping over tiger traps while loosing arrows at the unfriendly natives. Unfortunately it takes far too long to fire an arrow, so you have to forget that and make your way along by continuously edging forwards and ducking, then jumping over the pits when there's a clear spot. Even more unfortunate is that some of the villains fire impossible-to-see darts rather than hefty spears, so you have to hope that Guy's luck is holding up again. But worst of all is that the scene seems to go on forever. It simply refuses to end. After several agonising attempts, I gave it up and had a nice relaxing game of The Perfect General instead, so I'm afraid I don't know what the final two scenes are like. They could be extremely good, but somehow I doubt it. Well, that's about the size of it. I could harp on about the interminable animated intro sequences that you can't skip, or the save game option which stores a grand total of one position on a disk but I think it best to let the whole thing slip quietly by. Never mind Readysoft - It was a Brave Attempt (he said with slight affection). It looks and sounds great. The samples are particularly snazzy, and while Guy is a suspiciously Dirk the Daring-like character, his animation is a real hoot. The cable-car bit is excellent. It's a bit like taking all the good points of Operation Wolf and compressing them into one compact and bijou package. Erm, Guy's boots are highly amusing. But the rest of it is a complete non-starter. Wer die vorangegangenen Präsentationswunder der amerikanischen Company kennt, wird uns eine gewisse Skepsis hinsichtlich des Gameplays ihres neuen Spionage-Opus gewiß nicht verübeln - daß Guy Spy nämlich eindeutig in der Tradition der "Dragon's Lair" bzw. "Space Ace"-Reihe steht, merkt der Kenner bereits an der Hintergrundstory. Sie ist zwar so überflüssig wie eh und je, belegt aber trotzdem über ein Drittel der 14 Anleitungsseiten. Als ultimativer Oberschlimmling fungiert hier ein gewisser Herr von Max (weder verwandt noch verschwägert mit unserem ultimativen Oberschlimmling gleichen Namens! ), seines Zeichens ein übler Nazi, der die Welt mit einer gigantomanischen Wunderwaffe bedrohen will. Ob es sich dabei vielleicht um den Prototyp von Borfs späterem infantilitäts-Strahler handelt, war nicht herauszufinden, nur soviel, daß das adlige Mäxchen noch ein paar seltene Kristalle zur Vollendung seines Teufelswerks benötigt. Deshalb hat er seine Such-Sklaven losgeschickt, wovon wiederum Weltpolizist Amerika Wind bekommen und seinerseits den Agenten Guy Sy in Gang gesetzt hat. Der muß nun den Schergen des Unheils samt ihrem dicken Maxe über den ganzen Planeten nachreisen, bis er die Brüder endlich kaltstellen kann. Bis hierher ist die Geschichte also im großen und ganzen eine inhaltlich leicht veränderte Neuauflage der Backgroundstories von "Dragon's Lair" bzw. "Space Ace"; die eigentliche Spielhandlung könnte dagegen den "Indiana Jones"-Programmierern in einer schwachen Stunde eingefallen sein: Guy Spy ballert sich durch einen Berliner U-Bahnhof, schlittert über die Schweizer Alpen, verirrt sich in einer ägyptischen Pyramide, prügelt sich in einer afrikanischen Bar, übt Bogenschießen im Dschungel und steht viele blaue Bohnen und spitze Pfeile später in einem Peruanischen Tempel schließlich Baron von Max persönlich gegenüber. Man ahnt es schon, auch am Ablauf hat sich im Grunde wenig geändert: Der Spieler gerät von einer gefährlichen Situation in die nächste und muß durch beherzten Stick- und Feuerknopf-Einsatz die Haut seines Sprites retten. Sensationellerweise beschränkt sich die Aufgabe aber nicht mehr ausschließlich darauf, im richtigen Augenblick am Hebel zu reißen oder den Button zu drücken! Nein, Guy Spy hat verschiedene Kampf-Bewegungen im Repertoire und kann beinahe wie ein "richtiger" Held gesteuert werden, außerdem steht man in den einzelnen Bildern nicht so unter Zeitdruck wie bei den (inoffiziellen) Vorgängern. Ist der Spion dennoch mal wegen Blei- oder Dynamitvergiftung zu seinen Ahnen geflüchtet, muß man nicht unbedingt wieder bei Adam und Eva anfangen: Ein Spielstand kann gesaved werden, und wer schnell genug auf den Feuerknopf drückt, darf in der jeweiligen Sterbeszene beliebig oft weiter spielen, ansonsten erscheint nach kurzer Zeit der Titelscreen. Für die erneut sehenswerte Grafik zeichnet ausnahmsweise kein Mitglied der Bluth-Familie verantwortlich, stattdessen hat der hierzulande unbekannte Hugh MacLeod den Pinsel geschwungen. Sein Werk ist allerdings von ähnlicher Güte, wovon Ihr Euch anhand der Screenshots selbst überzeugen könnt. Sage und schreibe 5MB an Grafik flossen durch seine Digi-Feder, insgesamt 1500 Einzelbilder sollen flüssige Animationen garantieren - das dürfte ein neuer Rekord sein! Dennoch, stellenweise hatte Animateur Rui Albino große Mühe, Guy Spy realistisch zu bewegen, manchmal erinnert dessen breitbeiniger Gang eher an einen Windeltester als an einen Geheimagenten. Wer ganz genau hinsieht, wird auch feststellen, daß Don bzw. Sullivan Bluth doch etwas phantasievoller und aufwendiger gezeichnet haben. Der (abschaltbare) Klangteppich ist ebenfalls nicht mehr so voluminös ausgefallen, aber ist sehr atmosphärisch und fügt sich gut in die Handlung ein. Letzten Endes braucht sich unser Guy also nicht vor Ritter Dirk oder dem Jungen Dexter zu verstecken, und das, obwohl er sich mit vier Disketten und einem 512K-Amiga begnügt. Nach alter Ready Soft-Tradition ist der Schwierigkeitsgrad in allen drei Stufen recht moderat; er könnte aber noch eine ganze Ecke niedriger sein, wenn die Joystick- und Tastaturkommandos (auch Parallelbetrieb ist möglich) nicht leicht verzögert umgesetzt würden, was eine ziemliche Eingewöhnung erfordert. Immerhin gehören dank der neuen Disk-Bescheidenheit Wechselorgien und lange Nachladezeiten nun der Vergangenheit an. Auch hat man sich sichtlich bemüht, von den gewohnten "Dreiminuten-Games" wegzukommen, es gibt hier nur noch 13, allerdings recht ausgedehnte Spielszenen - wodurch sich direkt so etwas ähnliches wie Handlung entwickeln kann! Selbst Könner werden diesmal einige Stunden über die richtige Taktik in der verschiedenen Bildern grübeln müssen, doch andererseits ist der Spaß wie immer schnell dahin, sobald man das Game einmal durchgespielt hat. If Indiana Jones and James Bond had a son, he might look a bit like Guy Spy, although he'd probably more entertaining. Ho ho, not really. That was just me having a bit of fun. You cannot really blame me, I had precious little of it while playing the game. 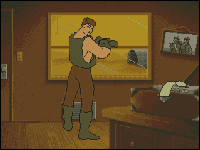 Guy Spy is the latest addition to that long chain of ReadySoft games - you know, the ones where Mr Gameplay hides under the seat, while big-sprited, slow-moving cartoon graphics do the driving. True, one or two of the scenes in it were quite enjoyable, but most got tiring very quickly. True, it is an improvement on previous incarnations (Dragon's Lair, Space Ace et al), but singing its praises for that reason would be rather like knighting the Yorkshire Ripper because he is not as evil as Hitler was. If this game was a horse, It would be a tin of Pedigree Chum served in a golden dog-bowl. Speed: Because the graphics are so detailed, the sprites so big and the animations so complex, everything moves very slowly. A lot slower than your joystick hand. As a result, Guy is more often than not doing something you wanted him to do a few seconds ago, which you have since changed your mind about. Just a little bit annoying, that. Difficulty: Infinite continues and full save-and-load facilities make it hard for Guy Spy to share a bed with the concept of long-term appeal. I got to level 11 (out of the 13) in two hours. Sure, it then got a lot harder, but being able to complete about 80% of the game in such a short period of time hardly signals money well spent. Depth: 13 totally separate scenes means - connecting graphic interludes or no connecting graphic interludes - this does not hang together as a game. There is no sense of development, progression or rising to a challenge. It is a 'been there, done that, may as well try the next one' sort of game. Constraints: Guy is limited to a very small number of moves, usually just three functions per scene (left, right, fire; duck, swing, jab; etc). Most of the scenes are single screen affairs, with Guy only able to move in a small section of the screen. In a few he is rooted firmly to the spot. The vast amount of animation data needed for every move means you do not get many options to choose from. Gameplay: The gameplay is certainly varied, with shoot-'em-up bits, beat-'em-up bits, maze sections and more. Because of the constraints there is not a lot in the way of real playability (though more than in previous games of this type). A couple of the scenes are fun, a couple more are passable, but the majority are dull, repetitive types that you can probably complete by switching to autofire and going for your tea. It has been said before, but not by me, so here goes... If I want to watch a cartoon, I will get up at six 'o clock on a Sunday morning. It won't cost me thirty quid and I get to ogle Michaela Strachan too. In other words, stuff the graphics - give me gameplay. At least enough to make a game out of. Sure, it looks great and it does have a certain amount of playability to it. However, there is little impetus to replay a scene you have completed, and therefore the easiness of much of the game makes it a bit of a lead balloon. Guy Spy has got a few things going for it, such as the fact that it indicates that ReadySoft are actually starting to realise that lush graphics do not, on their own, a game make. A couple of more titles, expanding on the progress made here, may mean the Canadian developers won't be needing the rifle club and Jimmy Hill's home address after all. Oh yes, and top marks for the gloriously camp way in which the Guy sprite minces around the pyramid maze. "That walk's got to be worth an extra five percent", remarked a passing Stuart Campbell. All right Stuart, you talked me into it. UPPERS A few fun scenes and an overall move in the right direction. Er... Um... The free poster is quite nice. DOWNERS Nice video, shame about the song. Too easy, too difficult, too slow, too clumsy, too dull, too repetitive, too limited. Too little. It could have been worse. (It could have been another Space Ace, for example). This style of game might just work if the developers can keep pumping up the gameplay. Guy Spy is awful, but encouraging. Guy Spy is quite easily one of the most eagerly awaited games of the year. From its initiation early on in January, and our special In Development article six months ago, interest has snowballed - the question on everyone's lips was: can real gameplay be added to Readysoft's stunning cartoon-quality graphics? Now, more than eighteen months on, the finished product is poised to hit the shelves and revolutionize the world of interactive gaming. The game's plot would not look out of place in any of Ian Fleming's James Bond novels. Guy is summoned before the chief of International security and informed that the evil Baron Von Max has located the whereabouts of the legendary Crystals of Armageddon. Max needs these crystals to power the awesome doomsday machine he's constructed in the mountains at an unknown destination. Taking up the mission, Guy must track down the tyrant, destroy the machine and restore world peace - hurrah! Guy Spy is presented as a cartoon adventure in much the same way as the Dragon's Lair series before it. In fact, the whole thing has been produced in more or less the same vein as Space Ace but features longer, more playable sections, with the player actually controlling Guy rather than guiding him when necessary. The term 'Interactive' when used to describe Guy Spy is still slightly misleading, though, as it's more interactive than most games. Although you do exercise control over the character, it's still never more than walk left, step right, punch or whatever. That's not to say that Guy doesn't perform numerous acts throughout the game. He has sword fights with Arabs, pole fights with Incas, and punch ups in bars - but he's never able to perform more than a few functions in any given situation. Each of Guy Spy's levels are totally different. In fact, it's like playing thirteen different games in one package. It's easy to see where the 1500 frames of animation have gone as no two levels are the same. For instance, Guy may find himself hurtling down a mountain side on a set of skis dodging sniper fire in one section, or picking off assassins during a ski lift chase. Every time you change scenarios, Guy's sprite changes, too. He never stands less than a quarter of the screen high, but he also moves into the fore and background, too. During the game, Guy will be called upon to traverse thirteen levels and utilise more in-game control combinations than there are Rice Krispies in a Toffee Crisp. You pick up Von Max's trail in Berlin where intelligence reports have indicated that the megalomaniac is travelling to Switzerland by train. After purchasing a ticket, Guy walks out onto the platform and waits for the next arrival. However, Von Max is already wise to our hero's whereabouts and dispatches a crack team of mercenaries to cut him to ribbons with machinegun fire. 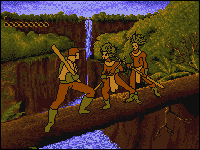 The one-inch-high enemy sprites bound onto the screen from the left and right on the other side of the platform as Guy dodges their fire and returns his own. For this section you are given three lives which are eaten up extremely quickly by repeated hits. White marks appear on the floor as the bullets pepper the platform and give you an indication of which way you should be heading. You can move Guy left and right in crab-like fashion via the joystick or, if you're stuck in a corner, a spectacular roll to the side will get you out of the line by fire. By moving the joystick in the four main positions you obtain control of the cursor that directs your fire. When it touches a target it turns red signifying that would be a good time to shoot. It's this very first section that frustration rears its head, though. The cursor doesn't scroll about the screen but jumps in half inch lots whenever moved often missing its target by an infuriating few millimeters. The mercenaries can do everything Guy can and most of the time a lot better. They are incredibly fast at pumping out bullets once they've found their mark and jump and roll about like a Russian Gymnast on Isotonic Lucozade, making the last few men very hard to hit. Each level is linked by an animated section to keep you up to date with the plot. In true Space Ace style, Von Max appears to taunt you just as Borf did in his games. Also, continuity buffs will have a field day as they spot all the mistakes between the intro graphics and the actual game screen graphics. 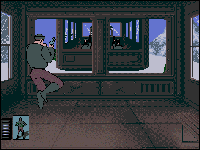 After the action scenario, Guy jumps off the train and runs into a ski lift. Somewhere between going through the door and passing into the cab he manages to materialize a hat atop of his well-rounded head! The varying game sections load very quickly considering their memory size. The static graphics, backdrops, etc, are of an extremely high quality, and make the rather simplistic renditions of the moving sprites out of place. Additionally, the animation serves its purpose well and if you had to rate it on the Eric Schwartz'o'Meter it would score a four out of five. There's something very strange about the way Guy walks in some of the screens, too. Early in the game, he moves around looking like he's recovering from a bad case of piles and, in the penultimate scene, he develops a wiggle which would make Julian Clary blush. Of the thirteen levels it's fair to say that most are enjoyable, but there's only a handful you'll want to play again. One section, which involves exploring a pyramid, requires mapping which I found very tedious and slowed the game down. Conversely though, others were completed within seconds of my first attempt. The best levels have been sensibly placed sporadically to keep the interest up, though, and there are enough of them to keep you coming back for more. Couple these with the fine and other humorous link animations and three difficulty settings, and the game goes a long way to restore credibility to Readysoft gaming. This is the closest anyone has come to a fully animated and playable adventure and the Canadian-base company deserve enormous credit. It's still not the perfect cartoon-quality game, but I seriously doubt whether a floppy-based Amiga would ever be able to house such a project anyway. That said, though, what Readysoft have achieved here is admirable and it's a hefty step in the right direction and one that deserves praise. It's by no means perfect, but give it a whirl regardless. Undoubtedly due to the incredibly memory intensive graphics, there was not a lot of room left for sound. However, Readysoft have not neglected this area of their game totally, and a brilliant atmospheric music track plays throughout, changing with each location. Some choice sound effects have also been incorporated at select moments and the usual slashing, gunshots, grunts and groans can be heard amongst a few others. At last, a playable cartoon adventure. Entertainment International's GUY SPY AND THE CRYSTALS OF ARMAGEDDON involves a mad Nazi scientist, and the pursuit of mystical, high-powered crystals by a van Damme-style muscle-hero. MICHAEL HORSHAM donned a holey green vest and 'checked it out'. Guy Spy is a seductive little number spread across four disks for the Amiga which, graphically at least, owes a debt to the hoary and now creaking Space Ace. Guy Spy (he's a spying kinda guy) uses the same great cartoon-inspired graphics as Space Ace, but this time to vastly better effect. The major complaint with Space Ace, if you recall, was that there was very little in the way of control over the bodily functions of your central character. So a game that could have been a bit of a stormer turned into a barely interactive shoot 'em up. Some have said that, with Space Ace, Readysoft sacrificed the more gamey bits for a good-looking animated adventure. A cosmetic exercise, some have said. Would it happen again? The adventure starts on a train station in Berlin where, having dispatched several of Von Max's 'goons' to early graves, he catches the train to the cable car station On his way up the mountain he has another gunfight with some pistol-totin' 'goons' in the cable car in front. Having done that he meets Olga, who does her best to delay him, and from there he skis down the mountain avoiding grenades. Then he flies to the desert to solve a maze, fight some Arabs and battle with a raging mummy. Next it's the deepest jungle where, after killing several natives, he encounters the temple of doom. Inside the temple mad Von Max has built his version of the world-dominating doomsday machine, powered by the crystals that are at the root of all this mayhem. Also in there is his lovely contact who was captured in the bar fight I forgot to mention. Guy is a bit of an hombre and, as a macho man, he enjoys a fair amount of fisticuffs. He doesn't mind using a gun, but hey - he'd rather 'have it out' using bits of wood, a bow and arrow or (the last refuge of a true man) his fists. Guy is such a spam-headed bruiser with a dodgy sense of honour, that at one point he actually throws away his gun just before mad Max comes at him with a knife. "Plonker!" I cried. He should have kept the gun and shot the bast. In the puzzle maze inside the pyramid. Just watch the way old Guy schmoozes his way around the dusty passages in search of, well... who knows? This man doesn't just walk, he swaggers. In short, he's a bit of a lairy hard-man, our Guy Spy. Screens are kept simple in terms of ammo-graphs and lives left, with just the state of the current ammo clip (if you're using a gun, of course) and the state of health of you and your opponent, be they sword-wielding Arab, crazed Egyptian mummy, or, ultimately a mad Nazi scientist by ze name off Von Max - read his name and quail in horror. The animation is by Rui Albino (fair enough!) and it's fab in a very Don Bluthy sort of way. Crisp lines, good characterisation and all those truly atmospheric in-betweeny scene-setting shots make Guy Spy a real joy to behold. Only the slightly sluggish responses of our man Guy to joystick commands made me think "preferably PC rather than Amiga". But that's a small gripe - once you're used to the pace of the thing you're in there, my son. Along with the outstanding graphic quality, Guy Spy is just chocka with great sound samples, from screams of death to Arab grunts, machine gun fire to the clang of cold steel upon cold steel during the sword fights. This kind of sampled quality really adds to the atmosphere. Add to that the slap of horny pad on Guy's fair fizzog during the Olga battle and the whole thing's pretty convincing, actually. It doesn't help, that on each level the joystick controls change their functions, but it's a case of 'horses for courses' really, as the range of tasks Guy has to perform need different skills. (Perhaps it's just a case of me getting set in my was by the end of level one). The other thing is, there are two women in the game and one is just a grotesque, violent, fat person (Olga) and the other is a helpless blonde who's just waiting to be rescued by our hero - not exactly positive stereotypes, are they? On the whole, Guy Spy is a high-quality, graphically-sound and, for that matter, generally sound adventure, with manny fist, pistol and swordfights sprinkled throughout. Plus there are some puzzle mazes to get through, as well as the episode with Olga. This, combined with three difficulty levels, means that the whole thing should take a while to get through, even if (or because) the controls take a while to become instinctive. Added to this, there's a tendency for a bit of unevenness,w ith some of the episodes seeming way more difficult than others. Still, that's just like real life really, I suppose. 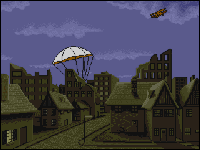 Ultimately, Guy Spy is an adventure game that is worth pursuing through tis various levels, if only for the great scene-setting and ingenious modes of death undergone by Guy the hero. Get used to the controls, persevere (you need to) and have a bit of fun defeating the Nazi hordes. Steve Keen was mightily impressed with Guy Spy giving it a whacking great 82% in its floppy incarnation. It wasn't perfect, but it was the most playable cartoon adventure yet. Now it all comes to the CDTV, exactly the same as the Amiga version but without the loading times. 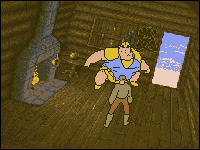 If you didn't know, Guy Spy was Readysoft's attempt at proper controls, rather than the 'select-a-move-and-wait-to-see-if-you-got-it-right' system of things used in the Dragon's Lair series. To be fair, in that respect they did get it right with Guy Spy. Yes, he moved when you moved the joystick, and you did have a fair amount of control over his actions, but when you're moving that size of graphic, things tend to get a little slow, and there lies the problem. Take the first scene, for example. You are in a train station in Berlin, and Guy is stood in the foreground with armed assailants in the background. They move quickly, but you don't. Consequently, it isn't very easy to avoid their bullets and it's very hard to hit them with yours. Needless to say, the graphics and animation are stunning, over 1500 frames at last count, and the soundtrack is booming and atmospheric. It's the most playable Readysoft game to date, but it still lacks the fluid gameplay to make it a real hit.